This is a category taken from the full feed of Musculoskeletal and Arthritis news provided by ARMA's members. 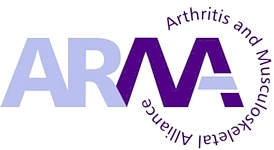 The Arthritis and Musculoskeletal Alliance (ARMA) is the umbrella body for the arthritis and musculoskeletal community in the UK, and our mission is to transform the quality of life of people with musculoskeletal conditions. We have 33 member organisations ranging from specialised support groups for rare diseases to major research charities and national professional bodies. New online infographic posters summarising the National Institute of Health and Care Excellence (NICE) guidance relevant to allied health professionals are now available online. Produced by the Institute of Osteopathy and endorsed by NICE, these easy to use resources provide a quick reference guide to current NICE guidance which can be printed and displayed in a clinical setting and support CPD. There are currently three topics available; osteoarthritis, osteoporosis and spondyloarthritis, with plans to develop others in the near future. 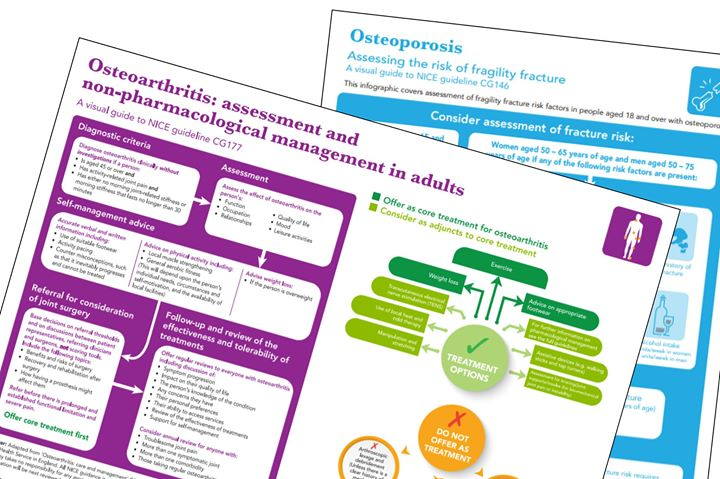 The posters translate the NICE guidance into an easy to follow visual format to aid health professionals in primary care to identify and assess for the conditions and provide recommended pathways for care and management. The infographics are available to download for free from www.iosteopathy.org/for-osteopaths/clinical-guidelines. ARMA policy teams and CEOs collaborated to agree a Policy Position Paper on Supported Self-Management for People with Arthritis and Musculoskeletal Conditions. The Policy Position Paper sets out recommendations for change. The evidence identifies the importance of patients as partners in their own care. While people with musculoskeletal conditions can play a pivotal role in their condition, most are simply unaware of the difference they can make. That’s why the Alliance believes people should be supported to take a proactive role in their health, to live well, feeling confident and in control of their condition with supported self-management. Currently, supported self-management sits at the side-lines yet it works – it improves quality of life and clinical outcomes. In the paper, recommendations include a whole system, integrated approach across the care pathway, joining up public health messaging and clinical care. ARMA works in partnership with our members and other stakeholders. Please get in touch if you would like to work with us to promote this paper, would like us to write a blog or article for your publication or are interested in other collaboration. The MSK physio-themed review is now live. Moving Forward – Physiotherapy for Musculoskeletal Health and Wellbeing highlights evidence from the National Institute for Health Research and others on why research in this area matters, assessment and matching patients to treatment, restoring musculoskeletal health and maintaining musculoskeletal wellbeing. You can download this review from the National Institute for Health Research website. Rapid access to the right care and supporting patients to be fully involved in their care is at the heart of a new capabilities framework launched today (31/07/2018) by NHS England, Health Education England, Public Health England, Skills for Health and the Arthritis and Musculoskeletal Alliance (ARMA). 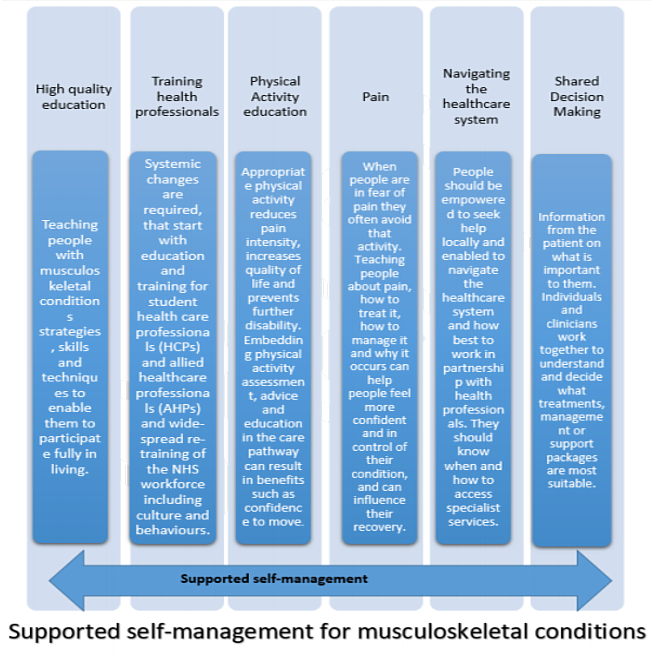 The Musculoskeletal Core Capabilities Framework, aimed at practitioners who will be the first point of contact for people with musculoskeletal conditions, sets out to support improved access to care and ensure quality outcomes for patients. Musculoskeletal conditions, such as neck and back pain, arthritis and rheumatic conditions, are the biggest cause of disability in the UK, accounting for one in five visits to the GP. They have enormous impact on quality of life for millions of people, with much of the disability avoidable. This new framework sets out the knowledge, skills and behaviours needed to deliver first contact practitioner expertise consistently and effectively in a range of healthcare settings. It helps to ensure that patients get improved access to person-centred musculoskeletal care and support early on, with musculoskeletal expertise part of the frontline general practice and primary care team. This approach could transform patient experiences, enabling people to stay at work or return to work more quickly, require less treatment at a later stage and have a much better overall quality of life. Beverley Harden, Allied Health Professionals Lead, Health Education England said: “Musculoskeletal conditions such as neck and back pain, arthritis and rheumatic conditions effect around 9.6 million adults in the UK and can have a significant impact on their quality of life. It is vital that those suffering from these conditions have timely access to the care they need to enable them to stay physically active, in work, education and socially engaged. Professor Peter Kay, National Clinical Director for Musculoskeletal Services, NHS England said: “The musculoskeletal framework makes clear the benefits of early management in supporting people to stay active and independent. A person-centred approach to care will not only deliver improved outcomes for people living with MSK conditions, but also improved outcomes for the health and care system. Visit www.skillsforhealth.org.uk for more information, or register to download the framework here. 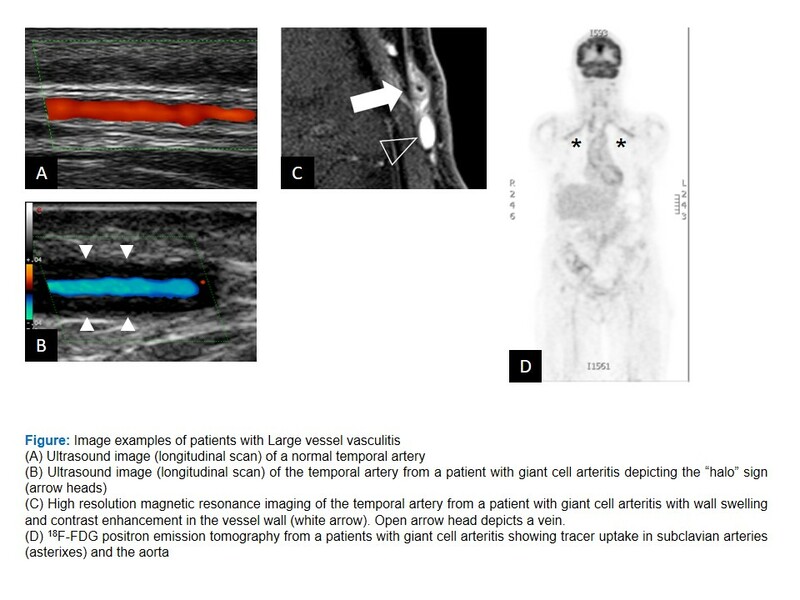 The European League Against Rheumatism, EULAR, has published a set of recommendations, which look at the use of imaging modalities in primary large vessel vasculitis, including giant cell arteritis and Takayasu arteritis. The recommendations are intended to advise physicians on the use of imaging modalities (including ultrasound, magnetic resonance imaging, MRI, computed tomography, CT, and positron emission tomography, PET) when making a clinical diagnosis of large vessel vasculitis (LVV), and when to apply imaging for monitoring of disease activity and damage. See the press release, Recommendations for the use of imaging in large vessel vasculitis in clinical practise [pdf] for detail and explanation. Accompanying the text is a diagram [credit to Christian Dejaco] showing example utrasound images of patients with large vessel vasculitis. Click here to see it in full size. This is the focus of the Safe Care Steering Group overseeing a James Lind Alliance priority setting partnership about safe care for adults with complex health needs, who have more than one condition or illness, or who need care from different teams and/or some care to be provided in their home. On behalf of the Allied Health Professions Federation, Dr Jo Watson, RCOT’s Assistant Director – Education and Research, is part of this Steering Group. The aim of the partnership is to scope priorities in regards to safety and getting patients, carer, public and healthcare staff voices heard. To this objective, the NIHR Imperial Patient Safety Translational Research Centre invites you to tell us about your concerns and which questions you would like to see answered through future research. There is a printable copy of the survey available, together with a free post envelope label (which can be printed and stuck on a size C5 envelope). Or if you would prefer a paper copy of the survey and envelope to be sent to you or have any questions, please contact a.lawrence-jones@imperial.ac.uk or call 020 7594 3149. Feel free to answer the questions as an individual or as a group with a specific interest in the area. The questions which are raised will be ranked through a further survey to identify those which are the highest priority for future research. The organisation running the survey, the NIHR Imperial Patient Safety Translational Research Centre, will publicise the results to research funders and will aim to undertake research in some of the areas prioritised. Please visit this website for more details. The survey closes on at the end of February 2018. 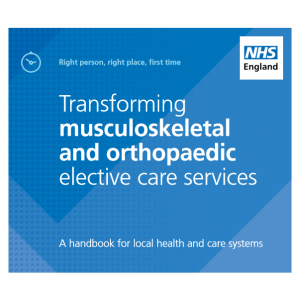 The NHS England Transforming Elective Care programme has produced its first two handbooks. They suggest new referral and outpatient processes for elective musculoskeletal/orthopaedic services and elective gastroenterology services. On 30th November 2017, the National Osteoporosis Society published new Osteoporosis Standards and Vertebral Fractures Guidance for Health Professionals. The guidelines help health professionals provide the possible care for people with osteoporosis. Fizz Thompson, Clinical Director for the National Osteoporosis Society, said: “The National Osteoporosis Society plays a key role in driving positive change in healthcare provision for people affected by fractures and osteoporosis, and these new documents – developed with clinical experts over a two year period – demonstrate how the Charity is setting the agenda in this area. View the documents here on the NOS website.